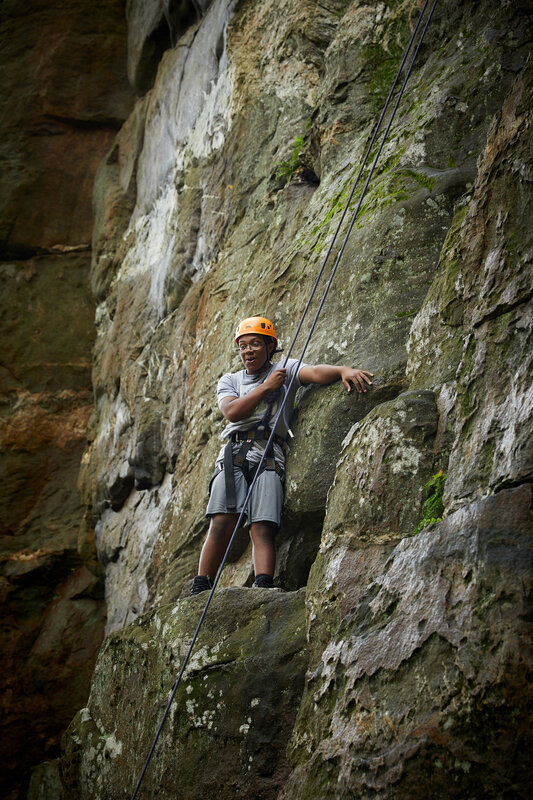 Earlier this fall I was contacted by a private school in Baltimore to make some images of students undertaking a multiple day hike in southern PA with the Baltimore Chesapeake Bay Outward Bound chapter. In the last year or so I’ve been focusing on kids’ science and exploration (hey, look here!) and this fit nicely into that niche. We decided to shoot the rock climbing day at Shaffer Rock, in Michaux State Park, as it provided many opportunities for great images, unique angles and chances to show teamwork. This was a last minute shoot and we didn’t have the final go ahead until 3 pm on the afternoon before the 8:30 am shoot. This made things a bit tricky: there was no opportunity to scout the location and no budget for an assistant. And, because the kids were already on the trail by the and out of cell phone range by the time the shoot was formalized, there was no way to contact the trip leaders to ask any questions or work out any details. It was pretty much a show up at the rock face and hope for the best. Luckily, I’m always up for an adventure. First thing I have to do is give a big high five to Ben Worden and the Outward Bound team for being so professional and accommodating every step of the way. (Pun intended.) I’m very attentive regarding the safety of all of participants in a shoot like this (less so my own) and the trail leaders did a masterful job of managing the needs of one pesky photographer (me) while shepherding the kids through a life changing experience. Next time I’m stranded on the side of a mountain with 60 lbs of photo gear I hope they are there to rescue me. Second, thanks to Subaru for making such great cars. The trail to the base of the rock face was closed, requiring a somewhat convoluted detour on some unmarked park roads to the top of the rock. My Outback isn’t a city car, but Roo just ate up the crunchy, gravelly, winding road. He seemed so… happy. Gear Notes: I’m a prime lens fan but because of the uncertain location and weather conditions Canon’s phenomenal 24-70 f2.8L II and 70-200L f2.8 (v1) carried the majority of the weight this go around. I also used the 16-35 f2.8L to get into some tight corners. I shot on a 5Dmk3 and 5Dmk4. Oddly enough when I shoot the two cameras side by side I like the color on the mk3 better. Anyone else? Scouting via park maps the night before revealed that the face was on the north (shadow) side of the hill so I lugged a Profoto B1 up and down the trail in a Pelican case, along with a big ol’ light stand and collapsible beauty dish. Everything is processed in Capture One 11.